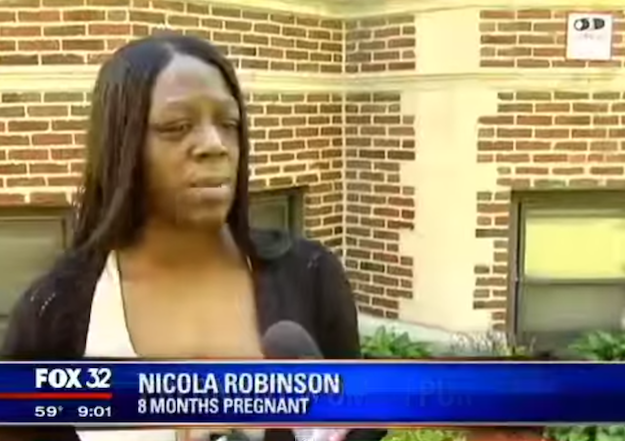 Earlier this week, a local Chicago Fox News affiliate reported an incident that took place last Friday, May 15th, in which a Chicago police officer had punched a pregnant woman. He then went on a racist tirade, including calling her a "black b****." Nicola Robinson is eight months pregnant. She was walking to her apartment with her one-year-old son when she saw a police officer chasing an accused drug dealer. The cop was too slow, and so bystanders began laughing at him. This is when the officer became angry, approached her, punched her in her right side, and berated and cussed at her. She reports that he even told her that she should be "happy" he didn't cause her to lose her baby. Others have supported Robinson's statements, including her sister who witnessed the violent act, and her apartment complex's manager, who says the attack was recorded on a nearby surveillance camera. The punch was hard enough to make Robinson go into premature labor. However, doctors were able to treat her and her unborn child. The surveillance footage has not be released to the public, but the Chicago Police Department has been made aware of the incident and plans to investigate. Michelle Denise Jackson is a writer, storyteller, performer, and Senior Editor at For Harriet. Follow her on Twitter @MichelleJigga or visit her website, www.michelledenisejackson.com. You may email her at michelle@forharriet.com.